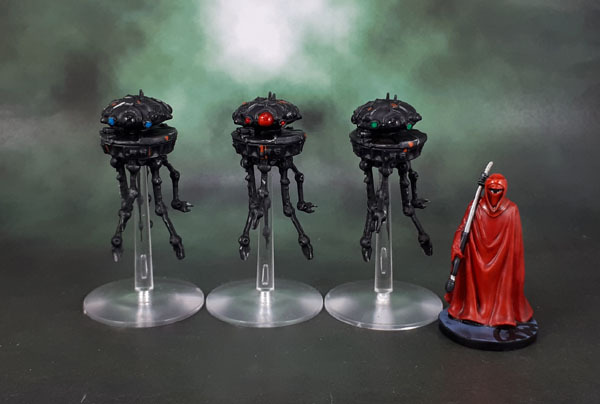 Star Wars Imperial Assault: Imperial Probe Droids | Azazel's Bitz Box. 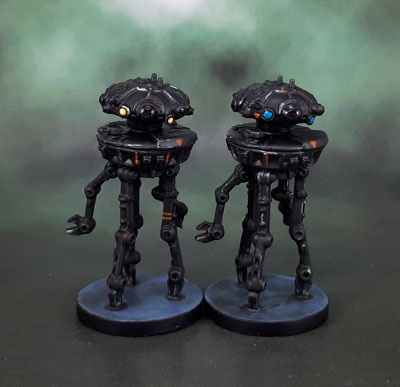 This entry was posted in Board Games, Star Wars and tagged Imperial Assault, Star Wars, Star Wars Imperial Assault: Elite Probe Droid. Bookmark the permalink. Every cloud has a silver lining and it looks to me that you’ve ended up with the best of both worlds. Very nice. Thanks! After a lot of stuffing around, the models have finally worked out well in the end. Shame we’re pretty much at the end of the campaign – hopefully they make an appearance in the expansion campaigns as well! That’s pretty cool of you to do! I’ve now gotten hold of all of the IA stuff, possibly sans one single figure expansion (inquisitor?) Of course, there’s a new expansion and individual models out next month.. 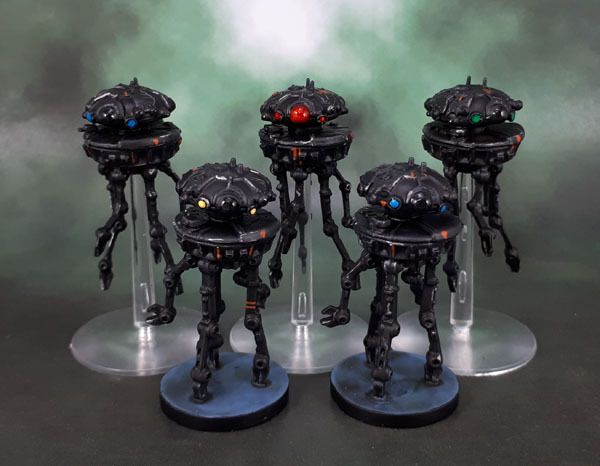 I think my droids run a risk of looking a bit skittles when placed all together like that, but when separated on the table as individuals (which is how they play) the different coloured lights will look much more natural. I think I actually like the ones on flying stands better. On the others, it’s too obvious that the bases are their support, so it looks like they’re walking on what (IIRC) are supposed to be just dangling sensor/manipulator arms. They’re all very nicely painted, tho. I really like the lenses, very shiny! Yeah, that’s my leaning as well now that they’re all done. Excellent work. The simple colour scheme works well and adding different light colours makes it easy to differentiate the droids. On the metal you achieve enough contrast to deliminate details. All in all beautiful and very evocative. Thank you – just enough edge wear and odd scratches to act as an additional highlight of sorts without looking like the Empire uses steel wool to clean them! I like all these, though the broken ones have been brought back to form nicely. Just curious, can you provide a link for the flying bases by chance? 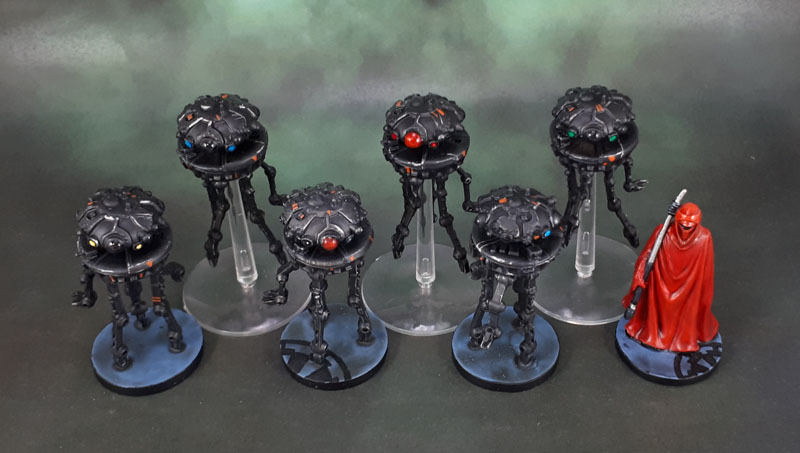 You always get extra stems with anything that uses those bases, so people who’ve been playing GW games for a while usually have plenty of all four stem lengths on hand. Unfortunately, it doesn’t look like MiniatureMarket carries the flight bases. I could probably ask them to order it though. 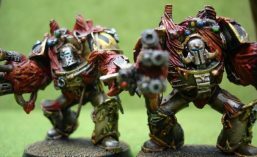 Do you have a GW store near you? Might be one of those occasions when it’s easier to just stop in. Yep, Alexis covered it nicely! They look nice- FWIW I prefer the flying stand ones. Thanks Pete – and yeah, I do tend to agree. I have to agree the ones on the clear stands look much better . This droid always gave me the creeps when I was little , it was the sound it made as it hovered around. I agree – They did a great job with that. The distorted speech sounds were what got me. Creepy sort of like listening to a numbers station. Very nice. Even though there’s not much going on with the colours, what you’ve done really gives them a lot of lift. Thanks mate. Star Wars Imperial stuff is pretty much black-white-grey for the most part, with red as the occasional spot colour. They look pretty awesome. I was the one who suggested the “flight pole”. Why I said “flight pole”, who knows!? I think Star Wars folks would know they are supposed to be flying, but other people might mistake them for walkers. So it’s good to see them on flight stands. Ah, sorry. I couldn’t remember (and I’m very tired lately). I haven’t mixed them myself, but I picked up these awhile back to add some more options to my range. 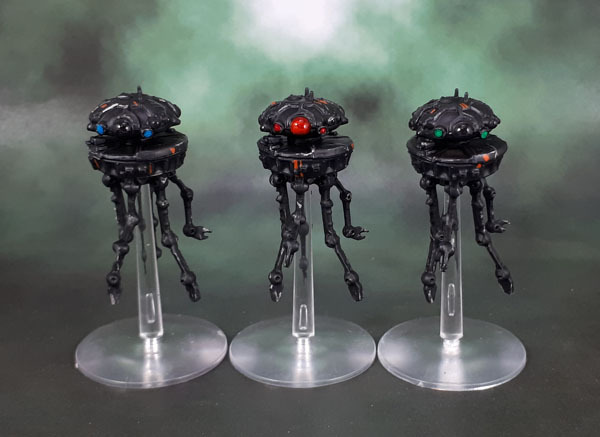 They’re pretty much identical, but in some different colours, so I’ve used a couple of them here (except the yellow, which is thin Air Flash Gits Yellow over white, with a spot of lighter yellow in the middle before gloss varnish to finish. You could decant the gemstone paints, but it seems like dropping them onto a palette could lead to a lot of waste? I guess it depends on how fast they dry up. Mine are all still fine, and I got them on release. So they’re doing better than a lot of GW’s paints there. Very cool – the flying ones look way better!